For Those of you who are connected with our website and have read our previous Seat Leon reviews, I'm sure you are aware about the struggle company is facing to keep itself in Market. To overcome common, at the Frankfurt Motor Show 2015 Company unwrapped it's all new Seat Leon Cross Sport Concept 2015. Featuring a sporty stance the model offers Sufficient power to rule the streets. 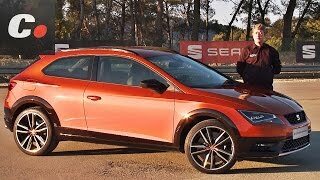 Let us have a look at the review Seat Leon Cross Sport Concept 2015 to learn more. 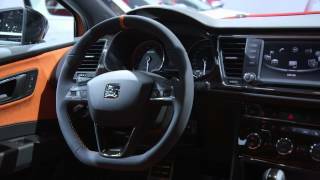 As expected the interior of the Seat Leon Cross Sport Concept 2015 is identical to That of recently released Seat Leon Cupra 290. Though to bring a bit of uniqueness, the model comes drenched in Barcelona sun while the gear shift knob, carpet and steering wheel gets the Essence of Alcantara with contrast stitching. Infotainment controls are mounted over the three-spoke steering wheel while the instrument cluster Comprises of two massive round gauges and three lighted indicators in center. In all Talking about the interior of the Seat Leon Cross Sport Concept 2015 I would say it might not be so special quiet but has the blend to steal the gleam. Just like the interior, the exterior of Seat Leon Cross Sport Concept 2015 keeps the resemblances with its hatch sibling. However the muscular arches and the bumpers make it looks more aggressive. Adding to the front fascia is the blacked out front grille and alongside are the black mirrors. The LED daytime running lights get a slimmer look while the door sills get SUV like cladding. In all the exterior features get a hike in comparison to the hatch version and bring the SUV look through the body architecture and designing. 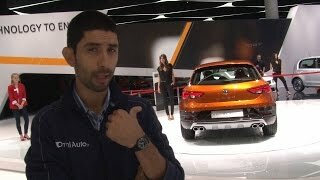 THUS rounding up the Entire exterior details of Seat Leon Cross Sport Concept 2015 I would say it has the capability to be your regular SUV with its looks and features. Rolling the 19 "Wheels of Seat Leon Cross Sport Concept 2015 is the 2.0-liter four-cylinder engine generating 295 hp and total output of peak torque of 380 nm paired to six-speed DSG dual-clutch transmission. The top speed of the Seat Leon Cross Sport Concept 2015 is Electronically limited to 155 mph while the 0-60 mph sprint in 4.9 seconds can be knocked.